Tom Brady and the Patriots have a chance to top themselves as the greatest dynasty ever. The New England Patriots are back in yet another Super Bowl — No. 9 since 2001, for those keeping track — and this time they’re the favorite to beat the Los Angeles Rams, according to both Las Vegas and our Elo model. Tom Brady, Bill Belichick and friends have been doing this kind of thing for so long that sometimes it’s easy to take their greatness for granted. But with another championship potentially looming, we thought we’d zoom out and take stock of just how incredible New England’s success has actually been. Because, love or hate the Patriots, we’ve never seen anything like what they’ve accomplished over the better part of the past two decades. New England has enjoyed some of the most dominant seasons of all time. Let’s start at the single-season level. 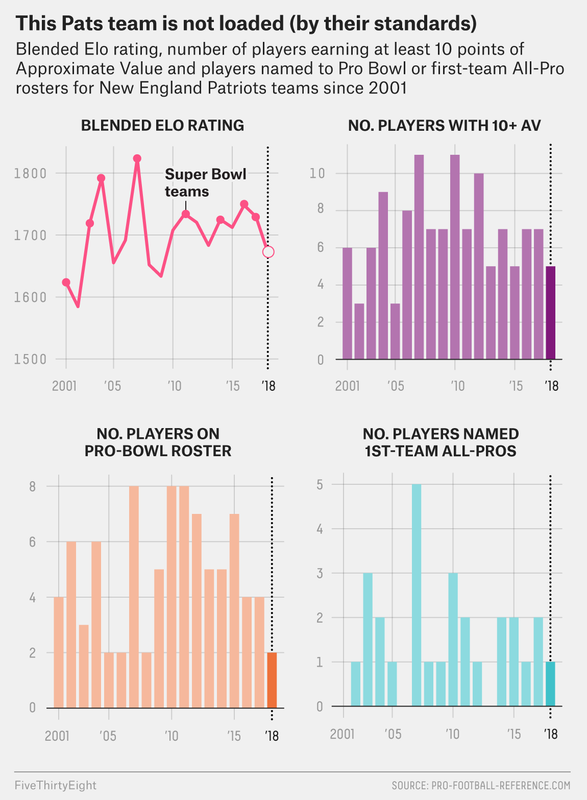 To grade a team’s Elo dominance, we like to use a blend of its final end-of-season rating, its peak rating and its season-long average rating.1 According to that metric, the Patriots own a number of the greatest teams of the Super Bowl era (since 1966) — including both the greatest team to win a Super Bowl (in 2004) and the greatest team to not win a Super Bowl (in 2007). Despite their loss to the New York Giants in one of the most thrilling Super Bowls ever, the 2007 Pats, who went 16-0 in the regular season, remain the highest-rated team in NFL history — in addition to being one of the most talented and influential teams ever assembled.2 And unlike that 2007 squad, the 2004 Patriots finished the job and capped off a 17-2 season with a Super Bowl crown, in a campaign that contained part of an NFL-record 21-game winning streak. This year’s Pats are not in that conversation. But the 2016 version was the 16th-best team to win a Super Bowl, according to Elo, and the 2017 version that lost to the Eagles last February ranks as the 14th-best nonwinner of the Super Bowl era. The Pats’ dynasty is the most impressive of the Super Bowl era (according to Elo). To do that for any given franchise, we take the single-season blended ratings from above and calculate their harmonic mean over every possible span of seasons. (The harmonic mean is a special kind of average that rewards high marks across every value in a set — in this case, elevating teams that were consistently great.) Then we compare that number to what a team with an initial Elo rating of 16173 would be expected to have over the same number of seasons. Since it becomes progressively harder to maintain a high mean Elo as more seasons pass, this helps balance short bursts of greatness against longer, more sustained periods of dominance. *The current Patriots’ run will be No. 1 if New England wins Super Bowl LIII. Mean Elo is the harmonic mean of a team’s seasonal blended Elo ratings (which mixes the average, final and peak Elo during the season) over the span of the seasons in question. Among stretches of anywhere near the same length, the only other dynasty in the same neighborhood as the Patriots is the San Francisco 49ers’ run during the 1980s and ’90s. Built by Bill Walsh and quarterbacked by Hall of Famers Joe Montana and Steve Young, the Niners won their five Super Bowls in a span of 14 years (including four in the 12-year span listed as their most dominant above). That’s two fewer than it took the Patriots to get five of their own from 2001 to 2016. (Those 49ers also weren’t embroiled in various cheating scandals, but that’s a matter for another story.) But the 21st century Pats have also visited almost twice as many Super Bowls as did the Niners (who, granted, won all five they made it to in this stretch). With the chance to tack on a sixth championship in 18 years, the Patriots would solidify the most impressive stretch of football the game has ever known. New England’s main dynasty also contains several GOAT-level mini-dynasties. Teams needed at least two Super Bowl wins during the span of seasons to qualify. Most great teams get only one truly historic period of dominance before they begin to break apart — particularly in the salary-cap era, when talent became tougher to hold on to and build around. The Troy Aikman/Emmitt Smith/Michael Irvin Dallas Cowboys, for instance, rank as our third-most impressive overall dynasty, but that run ultimately lasted only a few years: Aikman, Smith and Irvin stayed in Dallas for the rest of the 1990s, but as they got older, the rest of the roster wasn’t strong enough to compensate, in part because the cap forced the Cowboys to shed talent. The Patriots, though, have numerous nonoverlapping subsections of years that would each be the pinnacle of most franchises’ entire histories, and they’ve done it all in an era when the NFL is (theoretically) trying to promote parity. And one of the most interesting things about the Patriots’ micro-dynasties is that many were accomplished with different styles of football, despite the constant tandem of Belichick and Brady. As my colleague Mike Salfino pointed out last week, the Pats’ playoff offenses this decade have run the gamut from some of the least dependent on running backs to some of the most. It’s a testament to the chameleon-like way Belichick and staff have been able build their teams that they’ve maintained New England’s run of dominance despite constantly shifting their strategic tendencies. 2018 might be Belichick’s most impressive coaching job yet. Sure, we’re tired of the Patriots’ current “nobody believes in us” schtick. But it is true that this incarnation of the Patriots is comparatively underpowered, at least compared with previous versions of the team in the Brady-Belichick era. By whatever measure you want to use to account for New England’s talent level — star performances or team strength — this team looks less impressive on paper than usual. Not only is this the worst Pats Super Bowl team since 2001, according to our blended Elo dominance metric from above, but New England also had its fewest Pro Bowlers (two) and players with double-digit Approximate Value5 (five) in any of its Super Bowl seasons over that span, and its second-fewest first-team All-Pros (one, Stephon Gilmore). In fact, there were numerous Patriot teams that fell short of the Super Bowl entirely that, according to all of the categories above, had more talent than the 2018 version. Suspensions (Julian Edelman) and off-field headaches (Josh Gordon) certainly played a role in New England’s reduced star power, but it was also a roster Belichick had to cajole more wins out of than usual. Regardless, it worked — and it helped the Patriots extend their historic dynasty. The only thing left is to see whether Brady, Belichick and company can add yet another ring to their collection versus the Rams, the opponent it all started against. Excluding the first four games of the season, to give Elo the chance to “catch up” to a team’s true potential in a given season. For the Giants’ part, they can take joy in knocking off both the No. 1 and No. 10 best teams to not win the Super Bowl. The average Elo through four weeks for historical Super Bowl champs. Again requiring the team to win at least two Super Bowls. Pro-Football-Reference.com’s single-number approximation of a player’s contribution in a given season.